They sneer down the camera that Scottish people will lose something. 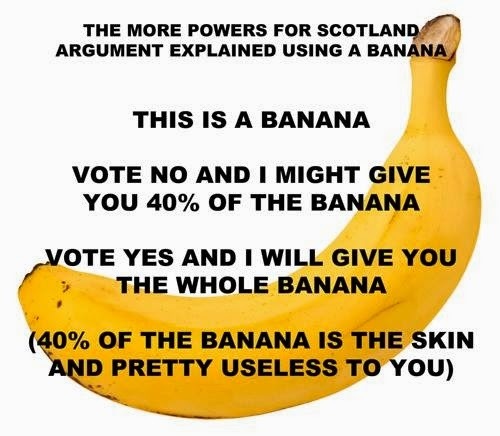 “If you vote Yes, you are forcing us to take away the money from your pocket.” That shiny coin you buy your milk with. That stuff in your bank account you pay for your wee package holiday with. Your Pound. The pound in your pocket. 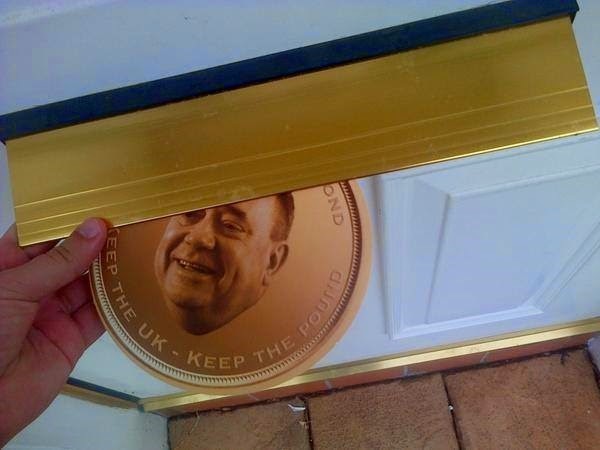 The crinkly note with her Majesty’s head on it – we’ll take that from you if you vote yes. You’ve forced us too. All of us agree. We won’t let you have it. So NOW what are you going to do? What is plan B after we imply we are going to force you into poverty? I won’t go into the fact that just because they say that they won’t “give us the pound,” (the very words when typed like that show how idiotic the notion is – but they know that) doesn’t mean we can’t have it and I won’t go into the fact that retaining the Bank of England (the Bank of the UK – our bank) controlled pound is really only one option, and it happens to be the option the SNP prefer – other parties differ. What I will say is that the no campaign, the new Westminster Right consensus, led by the Tories and presented by Scottish New Labour, have played a genius move. They have played a long game. They planted a seed and allowed fear and doubt take hold with every nonsense word they used to bolster and fertilize the embryonic notion. Of course, the next negative they have long planted, and nurtured – the other one they can say Salmond has no plan B for – is, of course, ship building on the Clyde. The UCS workers who stopped the Westminster Government of 1971 from further winding down of the yards, and in fact saved them, wrote their concerns aboutWestminster neglect a few weeks ago. And there are others Project Fear seeds that have been planted. Someone should make a bingo card for the last six weeks of campaigning with the main ones on it. You see, this has been their plan since the beginning. Project Fear was not about Aliens or the other nonsense Salmond began his questioning with during the big debate the other night (his advisors should be sacked – some Yes advisors are believing their own nonsense that those behind the no campaign are somehow stupid). All of those silly wee stories were thrown out to camouflage their real intent which is to concentrate on a small amount of amorphous, intangible stories they have worked hard at planting into the psyche of those who have been listening. This is what Tories do. They plant seeds and introduce notions of negativity, of selfish jealousy, or structural change, whose effects will build to their favour in the long term. It worked for Reagan. 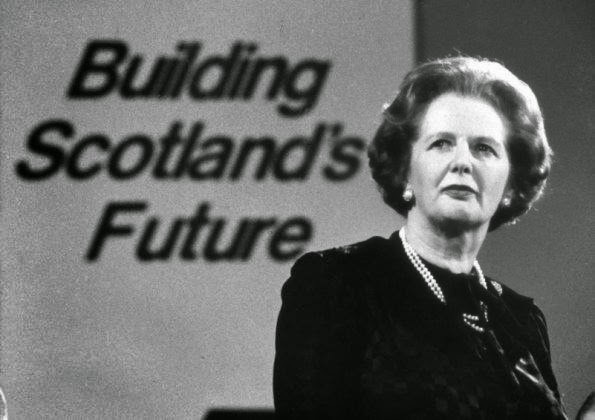 It worked for Thatcher. Notions that will split people and pit class against class, race against race and all in the game of siphoning off millions to their millionaire buddies. Of your pounds. From your pocket. Into theirs. Their positioning began a year and a half ago. They had to plant the seeds far down the line so no-one could remember that it was them that had taken our pound and our ships away from us. First sneering Osborne/Cameron/Clegg said they wouldn’t allow us to have them, and then Ed Balls/Miliband quietly agreed. In the past few weeks, Balls has upped his Mr. Nasty game, because the Labour Party MUST be the harder, more Tory than Tory, spokespeople for the new Westminster Right consensus in Scotland, and said “I will resign if the Scots are allowed to keep the pound.” That is how much he cares about making sure the Scots can’t have HIS pound. The pound in his expenses filled pocket. Paid for by your pound. The pound from your pocket. Will he also resign if the foreign Scots get the ship building contracts and the French don’t? Those damnable Scots, Take Take Take. The Westminster Right consensus took the pound away, set it out of reach, and they can now launch a “keep the pound” campaign. It is Machiavellian plus. The SNP, who say they will retain the pound, have been made to look as if they are taking “our” money from “our” pocket. Our hard earned cash. The cash from your pocket. Our shared currency. 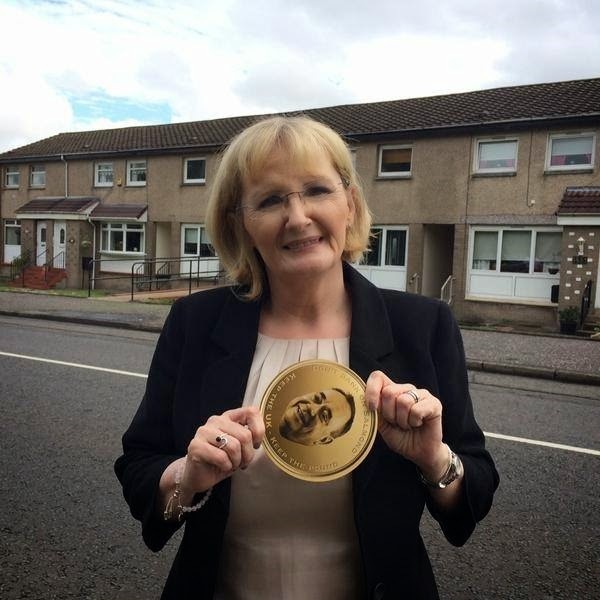 What makes me quake in anger when I see Johann Lamont sneeringly present her big toy coin to the Scots, are the very tangible things she and her Westminster buddies are taking away from us (this is the woman who said she thinks universalism should be scrapped, ie. benefits that we as a society receive – eg. NHS – GP, Accident and emergency etc - , free Education, pensions, bus passes, pensioners TV licenses, toll free roads and in Scotland, water). And if Lamont, Cameron, Clegg, Miliband get their way, all of those things will have to be paid out of your pocket. With your hard earned pound. Things can only get better for Richard Branson, friend of New Labour and Cameron’s Tories. A man who is buying up the English NHS department by department. That was once in your pocket. They conspire to dismantle our welfare state, our fair state, our civilised state, by stealth, for profits. To put in some millionaire’s pocket. Why should the scroungers across the road get these things when I no longer get them? Why should the brown people in the scheme across town get fridges when I no longer get child benefit? This selfish Thatcherisation of our society has been driven by successive Tory and New Labour Governments. Alastair Darling was a key driver in the privatisation and social security wrecking project. He controlled the purse strings. And Cameron’s lackeys in Scotland, the New Labour Party, are only too willing to see this project through. These people are driving us to foodbanks and back to the days of the “Poor Law” and towards charities housing the poor in workhouses. Move the problem of unemployment around, blame the unemployed for the lack of work, and punish them. A huge Tory and New Labour tactic that huge amounts of their energies go into, rather than the creation work. Bale them out of the stream, charge them, beat them and make them feel guilty for being thrown over the bridge by the toll man who only allows the select few to cross, and then throw them in again. 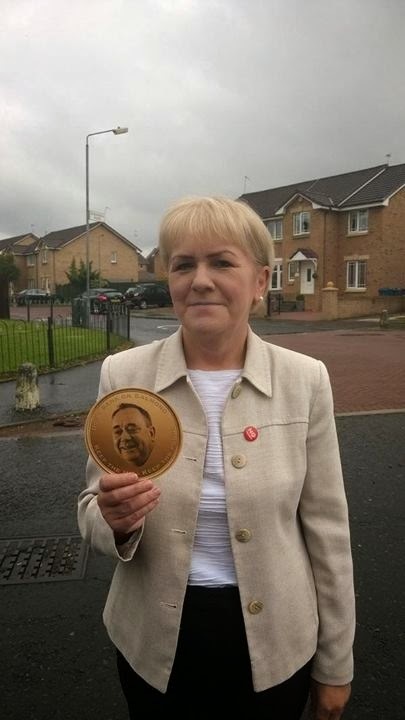 Stealthily stealing your pound: Scottish New Labour Leader, Johann Lamont. Both Scottish New Labour under Johann Lamont and the Tories have set out to create the same selfish discontent about our universal NHS. They started with attacking “health tourists” who, despite any substantial evidence, apparently come here and drain our national health service of our pounds. Your pound. The pound from your pocket. This has led to the announcement that sometime in the future, oversees visitors will be subject to prescription fees and charges for emergency care. And there has also been suggestion that those using the NHS “more than others,” should pay a fee to visit their GP. The charging at the point of use culture is slowly moving towards you; health to those who can afford it; because the businesses taking over the broken up NHS have to make increasing profit year on year, and if they don’t because too many poor people are sick, then watch out bubbling stream, in you go. 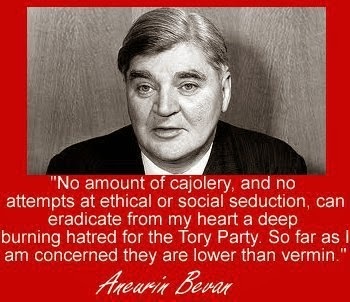 Some poor souls in that much diminished party do remember, but are powerless to stop big money drain their once great party of human blood and integrity, leaving a grabbing husk of a thing controlled by the self interested and politically ambitious. The deficit “must be reduced,” the bankers crisis is being used by the new right consensus of New Labour and Tory alike to pit the now struggling middle classes against these new underclasses. They socialised the millionaires debts (gave the poor wee rich men welfare. From your pounds. The pound from your pocket. Into their profit and loss account or offshore account), and are smashing all of the benefits of living in a wealthy, healthy state that can afford to help those who have fallen. Thatcher... planting the seeds fertilized by Blair, Brown and Darling and now brought to fruition by Cameron. The attacks from the Better Together audience members during the debate the other night on our free prescription charges and our no university fee’s, was telling. And more telling, was that Darling just sagely nodded, but said nothing. The Scots are undeserving. The English are paying, while the Scots aren’t. Conserve and inflate the Scot’s on English welfare myth. How dare they. How dare they suggest the Yes campaign will take the pound from your pocket when they are already pushing to do that. Because Health and Education are some of the very tangible things threatened by the Westminster Right consensus. Two of the things your children will be forced to pay for. Because Tories, red or blue, play the long game. They make investments. They are investing in impoverishing you further. And Scottish Labour is a big part of that consensus. Part of the narrative during the Salmond/Darling debate was that the Scots are being selfish in protecting these things, when they have been taken from the English (by the Tories, with the help of New Labour and the Liberal Democrats). The English are paying for prescriptions and for university modules. 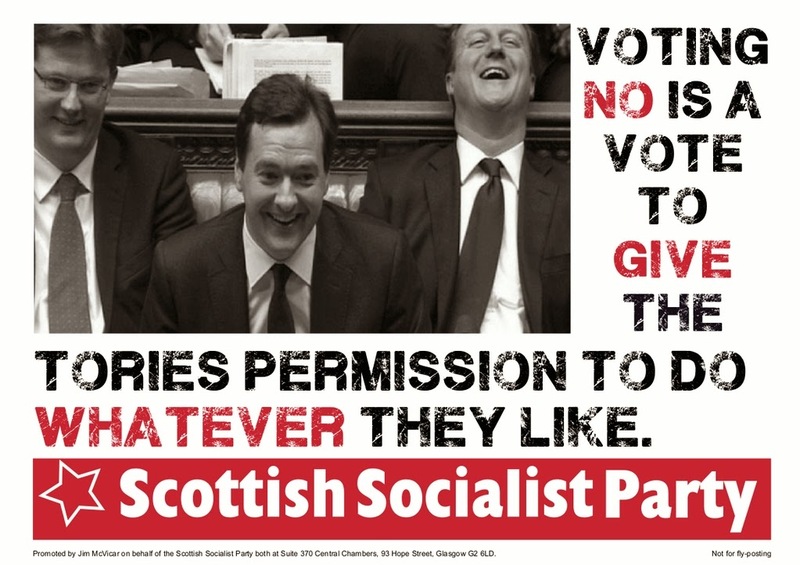 How selfish the Scots for not wanting to be part of the Tory driven, Labour supported austerity programme! A programme other countries, most notably our oil producing neighbour Norway, (and the much maligned Iceland) have not followed. The Westminster parties and the financial interests around them are breaking up our NHS, into smaller parts, to be sold off, bit by bit. And in England that process is accelerating as legislation down there has made it legally binding that the state gives up its biggest, best asset. They are re-diverting our taxes to big businesses who will eventually charge us twice for medical care (once from the tax benefits they receive and also at the point of use) and it will all be blamed on the “sub-species” in desperate need. Taking your pound twice. The pound from your pocket. Those who think a no vote in September will mean our NHS will tick along as it is as we control Health, are burying their heads. The Barnet formula, worked out using spending in England as a factor, will reduce as the English NHS is broken up and less and less of it is funded publically. Our NHS will receive less funding as the English begin to pay huge prices for services they once shared socially through taxation and national insurance. 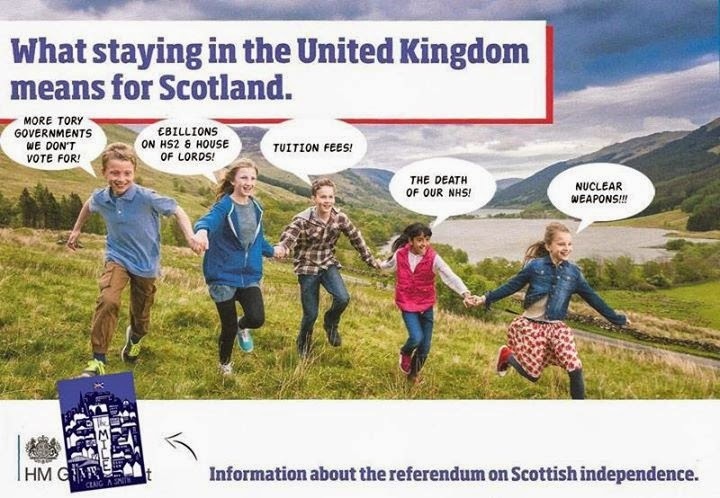 The Scots, after a no vote, will be financially brought back into line. The Westminster Right consensus (Darling’s New (Scottish!?) Labour, the Tories and the "Scottish"/ Liberal Democrats) are bullying the poor in order to take away our welfare system. They are smashing our NHS into smaller bits in order to charge. Next, they will smash our education system into bits in order for millionaires to make money from other millionaires while the rest of us put up with a leaking, overcrowded, book and pencil poor education system. The seeds have been sewn by Gove. And the Labour Party is slowly positioning themselves to agree. And they will tell us it is for our own good, while they claim expenses for their food and duck houses. Why should each of us pay for the scrounger’s children? Why should we pay for the refugee escaping war, famine, oppression? Why should my taxes pay for some poor old person to have soup and a comfortable chair as life leaks from her frail body minute by expensive minute? Caring for these leeches, these sub-species is taking the pound from my pocket. So when they tell you our pound is in danger, our ship industry is in danger, those rats are spending your money on big TV’s, remember, it is them who are taking the money. It is them who are taking your pound. The pound in your pocket. It is them that are placing the toys on the top shelf. And it is only a Yes that will make us taller.